The BAC is an organization chaired by Miguel Roldán, which offers academic stays in Barcelona to foreign architecture schools. It was created with the aim of developing academic and research collaborations with other universities and higher education institutions across the globe. We are continually building an international network between universities to develop architectural research projects in common. This network includes new partners every year from a variety of geographical areas, as we are especially interested in focusing on local and global points of view. Over the last 14 years our program directors have had many different experiences in organizing innovative workshops, such as FAST and Groundcontrol, programs devised with the intention of training young Catalan and Dutch architects in the frame of European urban and landscape design tendencies.We have kept exchange programs with: ITESM, Monterrey, México from 2002-2008, Texas A&M University, USA since 2000, Clemson University, USA since 1999, the University of Texas at San Antonio | UTSA 2008-2009 Université de Montréal, Canada, 2003-2006, the Universidad Iberoamericana de México, 2001. The BAC has reached a number of over 1000 students since its foundation.Currently, we are collaborating with several American and Asian universities. This year we welcomed a group of Japanese students from the Shibaura Institute, Chiba University, Tama Art University, Toyo University, Tokyo University of Arts, Kyoto University of Art & Design, Hosei Uni-versity and Tokyo University of Science. 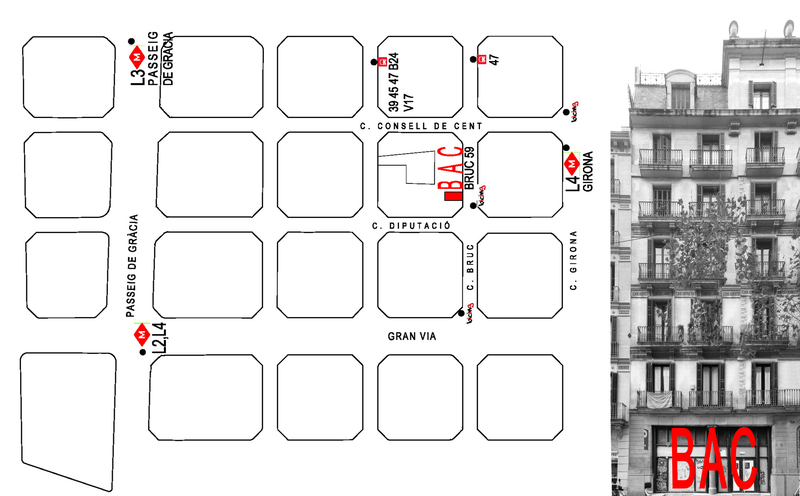 The new Barcelona Architecture Center studio is located in Eixample, a district between the old city and what were once surrounding small towns, constructed in the 19th and early 20th centuries by Ildefons Cerdà. It is only a short walk from La Rambla, Plaza Catalunya, and 10-15 walk to the the old port and seafront, numerous historical and architectural points of interest, as well as various bus and metro stops, connecting students to all parts of the city.